Big Three automakers plead their case, and a Wisconsin Democrat argues they should get help. On CNN this morning, Senator Russ Feingold says some of the $700 billion financial services bailout ought to go to Chrysler, Ford and GM. "Bailouts are no fun and they should be avoided wherever possible," says Feingold. "But . . . this is something worth fighting for. It&apos;s just as worth fighting for as Wall Street. 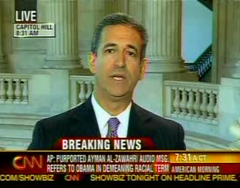 Feingold says he&apos;s "kind of shocked" to hear some talk of allowing the automakwers to fail. "It doesn&apos;t look good," he says of the prospects for a bailout, adding that any package must include guarantees for changes in fuel efficiency and requiring good management practices at the domestic auto makers. Feingold says the $25 million dollar figure seems "very reasonable" to him. In a statement , Feingold says collapse of the auto industry would devastate manufacturing, wreck an already ailing economy, and possibly end up costing taxpayers even more in pension guarantees, unemployment benefits and other costs. Senator Herb Kohl says any help for automakers "should come in the form of a loan, with strong preconditions of change for labor and management, accountability and protections for taxpayers."